A most un-orthodox Easter… part one. 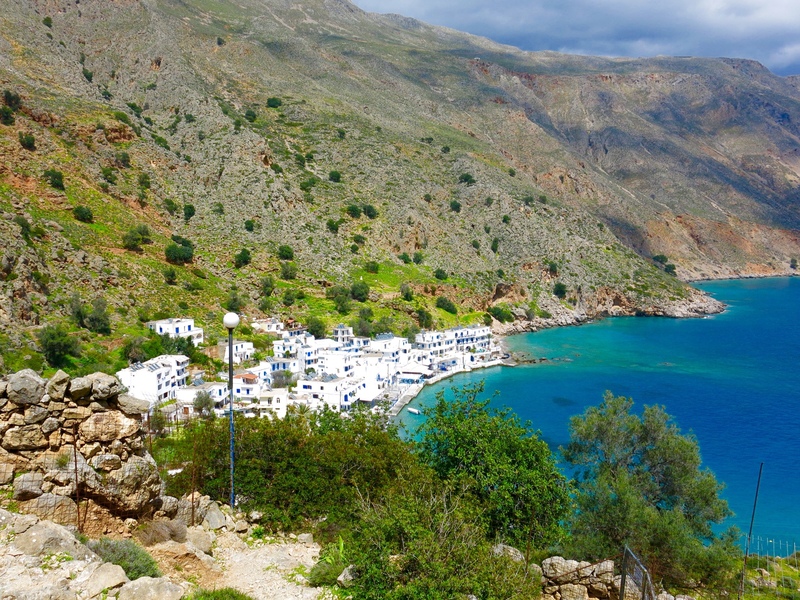 Ever heard of Loutro? no, I didn’t think so. It’s a very small, some would say tiny, laid back village on the south coast of Crete. 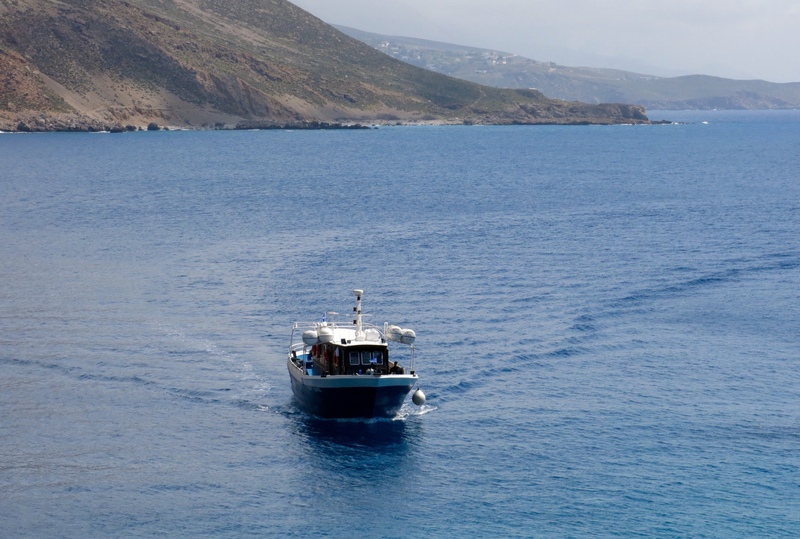 The only way to get here is by boat, unless you are very adventurous….. or very stupid….when you will arrive here on foot…..by walking about 7 kilometres from the nearest village of Hora Sfakion. Sounds like an easy stroll eh, except it’s far from that, as the twisty and turny goat track takes you high-up along the cliff face for most of the way….. so expect to walk for about 2 scary hours. There are no cars on Loutro , no motorbikes either, because Loutro hasn’t any roads. 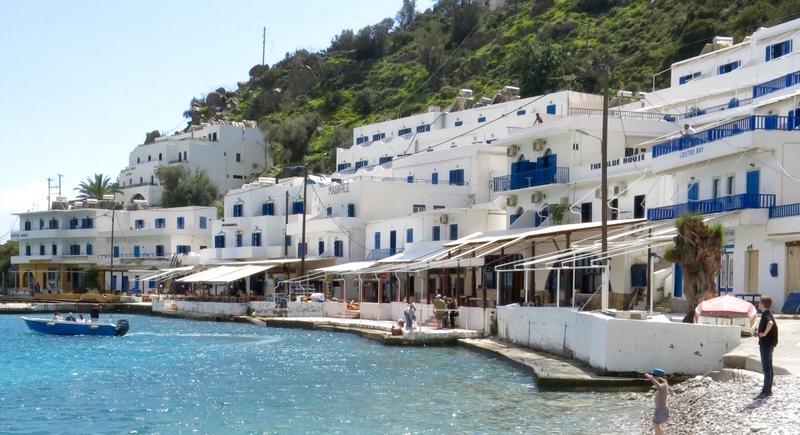 It’s a really pretty little place tucked into the cliff face around a horseshoe shaped bay….. and more like a village in the Cyclades than typically Cretan….. every building is painted white with blue shutters and doors? We tried to book a hotel room here for a weekend visit in March, but none of the hotels open until 1st April, and even then just a few of them. Anyway, before April 1st there is only one ferry a day from Hora Sfakion to Loutro, so it’s not really an option. Loutro from the cliffs above. 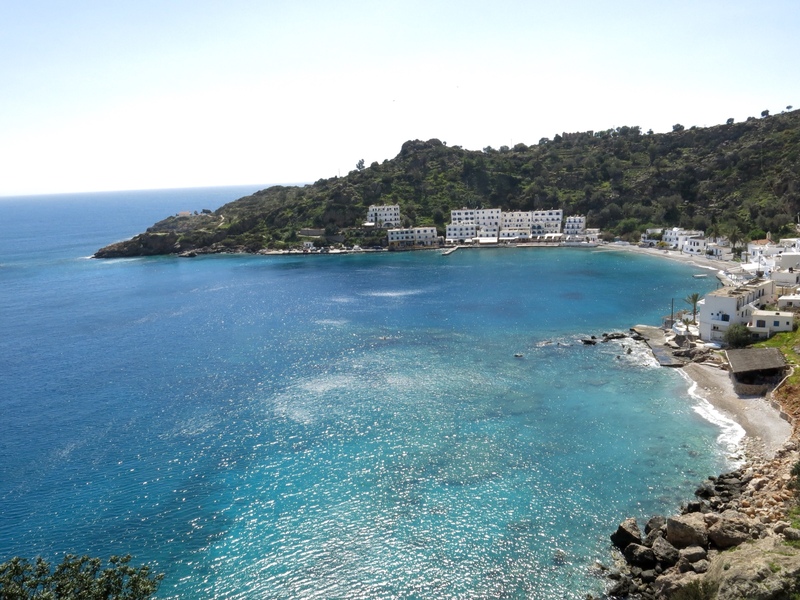 We called the owner of the Porto Loutro Hotel a few days ago to enquire about availability…. didn’t want to get all the way here to find it booked out….. after all, it is the Easter Weekend, albeit not the orthodox Greek Easter, but the other one. 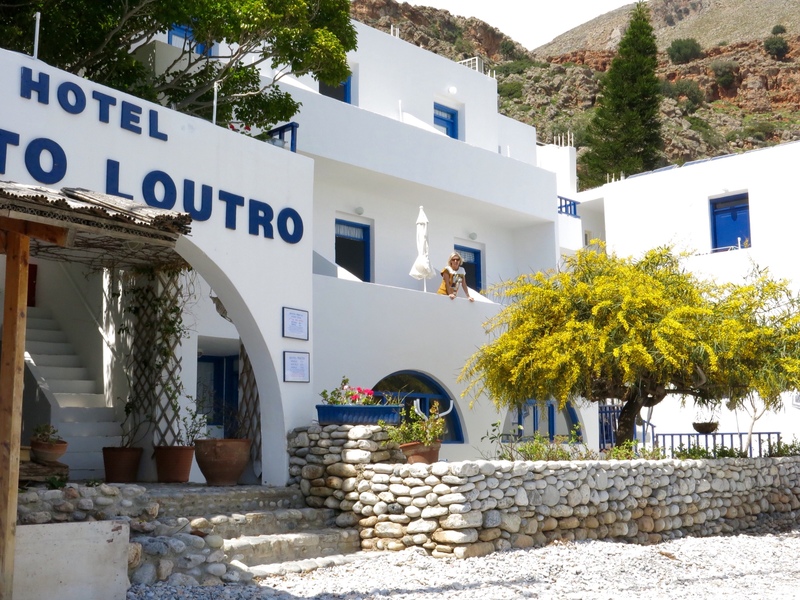 Alison, the english owner of Porto Loutro, informs me that yes, she has rooms available…..at a special rate of 40 euro a night….. with sea view, with breakfast…. OK, I say, what do you need from me to confirm the booking. Her reply was ” nothing. just turn up”! Now according to the Ferryboat website, there are presently three ferries a day calling in here, at 10:30am, at 1 pm and at 4:30pm, and I inform Allison that I’ll be arriving on the 1pm ferryboat. ” No you wont” she says ” it’s not running”…… she explained that it hasn’t yet turned up from wherever it spent the winter….the seas have been too rough for this small passenger ferry. Now YM hates getting up early in the morning, but as I make the decision to get the morning ferry, it means she’ll need to. 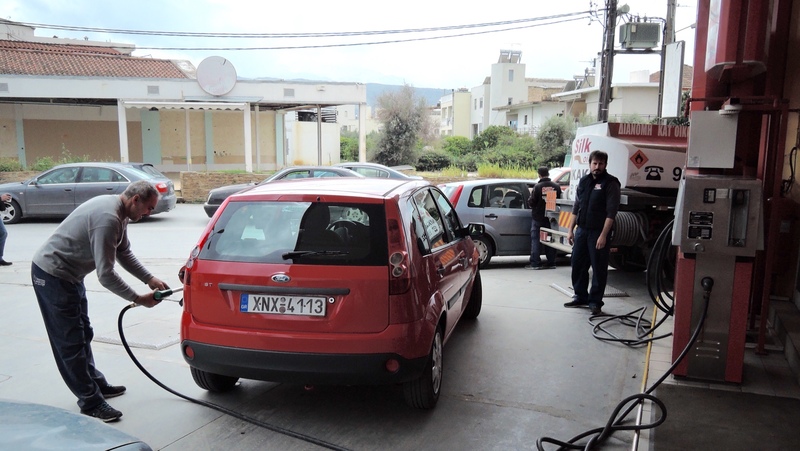 It’s about an hour and threequarters drive from Xania to the ferry boat dock in Hora Sfakion, providing we don’t lose our way while driving up and over the mountains to get there! Last night I bought a good road map of Western Crete, so shouldn’t be a problem, but this is Greece, so you can never be sure. 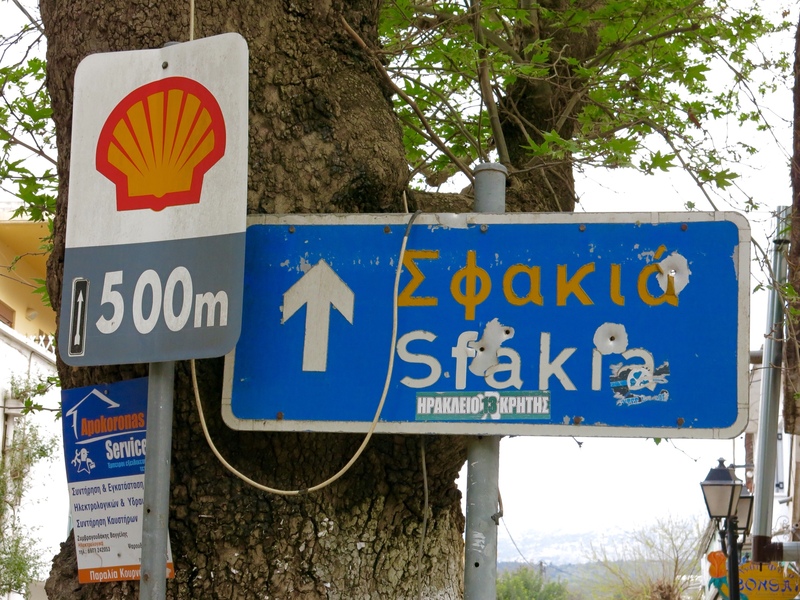 The road signs here are not always in the right position, are missing, or have been defaced with graffiti ….and because we are in Crete, a popular sport in the mountains seem to be use road signs as target practice…. A lot of the road-signs outside the city have been peppered with bullet holes! So it was an early start, leaving Xania at 8 am, with our hire car from my mates at Tellus Car Hire, and after stopping to fuel up ready for the mountain drive, we head off on the spectacular, winding, scenic road…don’t look down, the road clings to the side of the mountain…and we make it without a hitch to Hora Sfakion. The ferry hadn’t arrived yet, but we were assured by a local kafe-neon owner that it would be here soon. We had time for a cup of coffee and a bite to eat at the Harbourside cafe and soon enough, as promised, we spot the car ferry coming into the small port. Why a car ferry though, to somewhere that doesn’t have any roads? 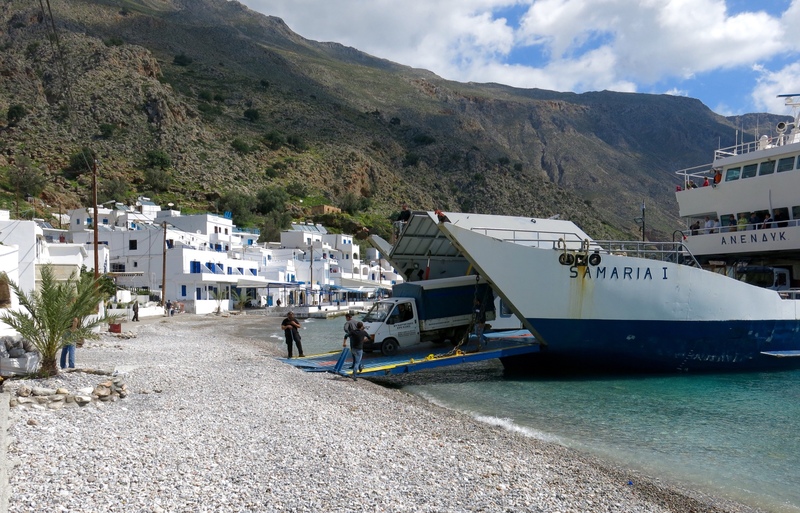 Not only does it call at another isolated village on the south coast, where there is a sort of road leading out of it, but as we discover later, this ferry carrys small trucks and vans as well, loaded with goods which, after the ferry has dropped off passengers at the Loutro Jetty, then heads to the town beach and the vehicles ‘disembark’ landing-craft style, onto the pebbly beach. The ferry boat then returns later in day to pick up the by now empty vehicle. This is the only way that the town can be re-provisioned. While we were there, they even landed a fuel truck on the beach! With a very long hose…a VERY long hose….from its parking spot in the centre of the beach it proceeded to refill all the fuel storage tanks of the hotels and cafes surrounding the bay. Anyway, back to Hora Skafion, and after coffee I drive the car along the jetty and park it no more than 30 metres from the ferryboat. We are going to leave it here for two nights, and no worry about the security…. We have been told that you could even leave the keys in the ignition and the car unlocked, and it would still be there a few weeks later….despite this reassurance, I still lock it and take the keys with me! 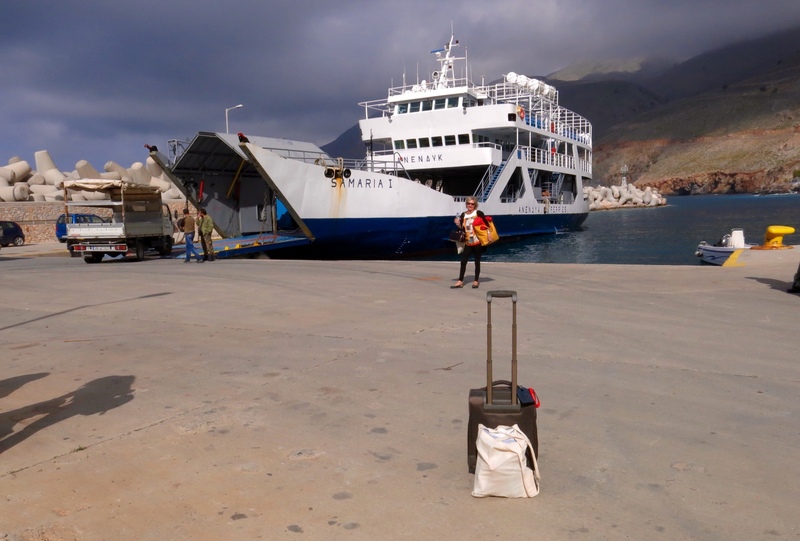 We board and buy our return the ticket on the ferry, and 20 minutes later we are arriving in Loutro…. And it looks spectacularly pretty…. especially arriving this way…We are travelling very light for once, just a small aircraft-locker style pull-along, and we make our way past the taverna’s lining the waterfront, to our digs for the weekend, the hotel, Porto Loutro, situated right ON the beach in the centre of the bay. According to ‘trip advisor’ it’s the best hotel in the village, and as most of the others haven’t yet opened for the season, we don’t have a lot of choice. The hotel is run by an English-women, Allison, who is married to a local Greek man… who is a part owner of the ferry service. As promised, the room is directly in front of the ocean, with fantastic views of the bay…. from the balcony I could spit into the ocean if I felt like it, it’s that close! 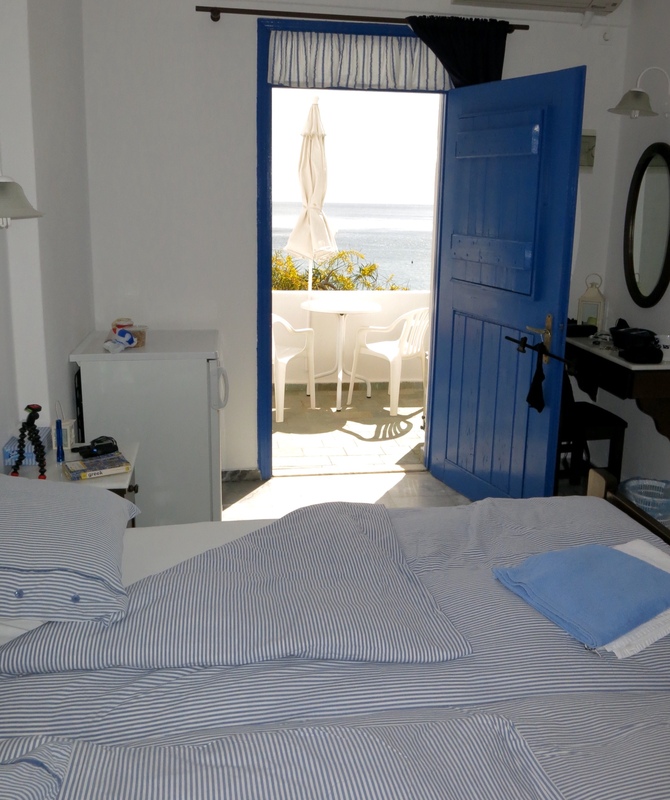 In most of these small greek hotels/pensions, the beds are single…and hard….and this is no different…. but at Porto Loutro there are some nice little touches in the furnishing and fittings which shows someone cares…. Alison I guess. …. and the room is also spotlessly clean. But what is it about shower curtains though, that Greeks don’t like? The bathroom is typical of many of the small hotel rooms I have rented in Greece, a washbasin, a toilet and a shower…. 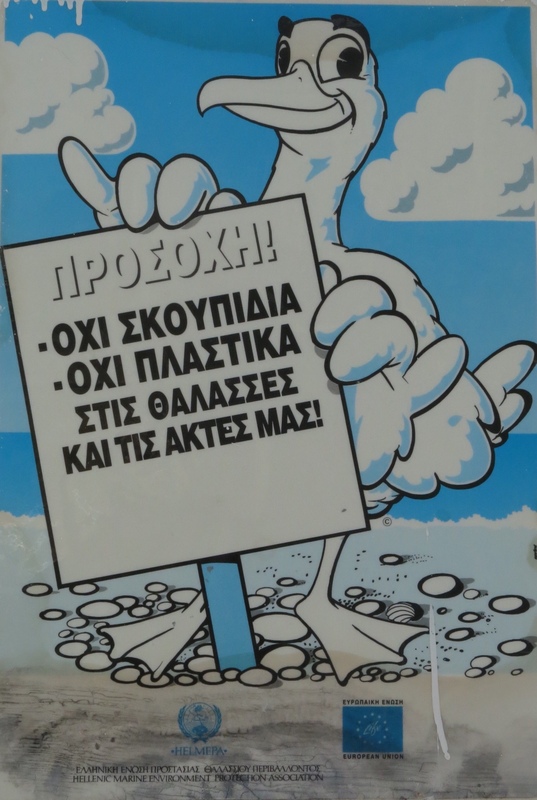 But no shower curtain….χωρίς κουρτίνα as they say here…. So whenever you take a shower the floor of the bathroom gets flooded. At the hotel in Agios Nikolaos last year, they even supplied a type of squeegee device, similar to the thingys that they use to get rid of water off a cricket pitch or tennis court, to push the water away from the doors…. It was obvious that the builder must have mislaid his spirit level, as the floor levels led the water away from the plug hole and into the bedroom! One more thing about Greek plumbing…and a delicate subject which I had though of devoting a whole blog to, calling it ‘Hellenic Origami for beginners’. 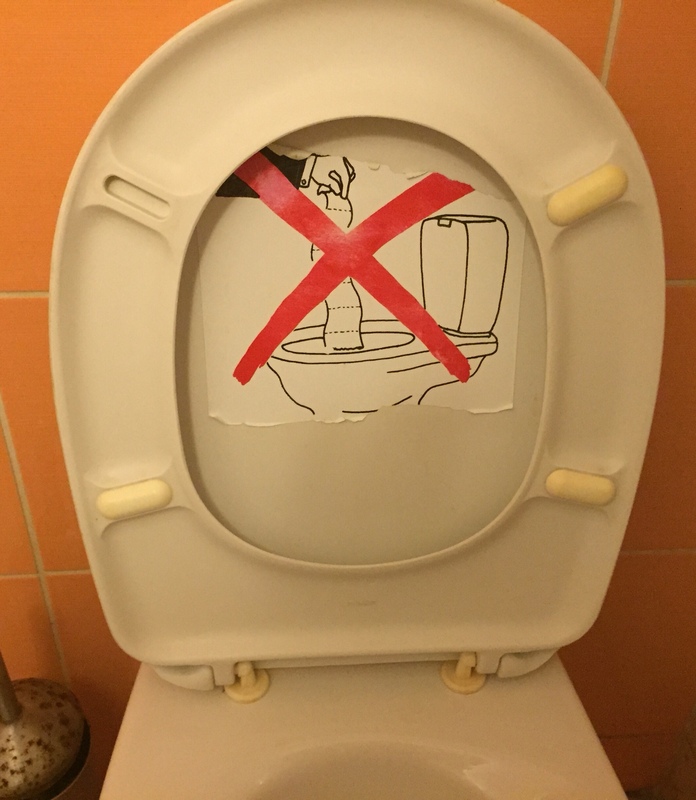 In Greece, the only thing that you can put in a toilet has to first be put into your mouth….. You’d better read that again! ….Or maybe I’ll put it a different way. 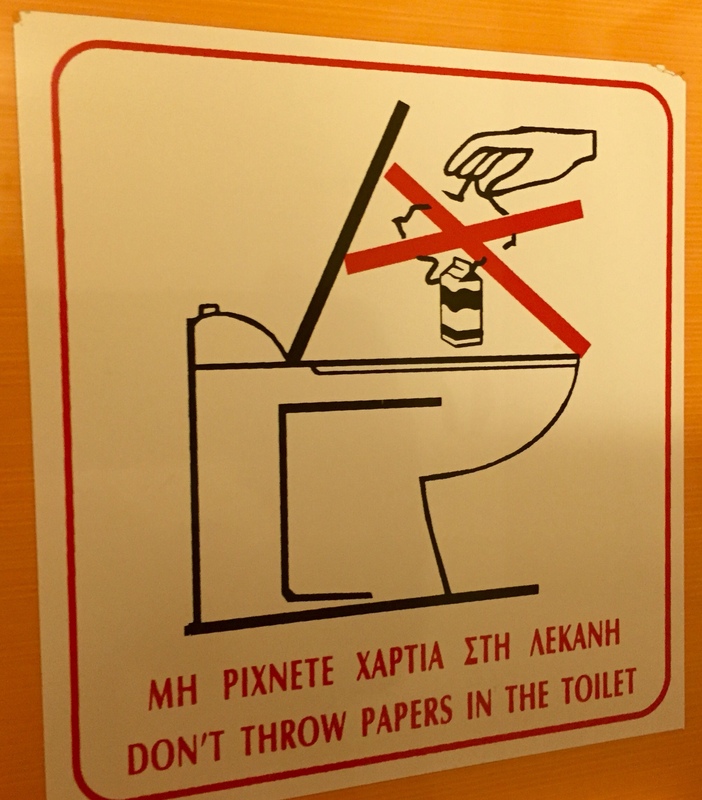 In most places in Greece, you cannot put any tissues or toilet paper into the toilet bowl…. Nothing at all that hasn’t been through your own personal gastronomic process. So what do you do with the ‘used’ pieces of toilet paper? Well in every toilet there is a small plastic or tin bucket, normally, (but not always) , with a foot operated pedal to open the lid, in which you place the ‘dirty’ paper. But it’s not good form to just to drop in in without first folding the paper….unless you are a bogan….by first folding the tissue in half, then in half again, then again, and amongst us Origami Experts at least, by folding one last time until you have a small square of about two square inches( no need to measure it, close enough is good enough in this case) …. Then the offending scrap of tissue is delicately dropped into the bin. Voila! Unfortunately, if you cannot avoid having to use a toilet in a cafe or restaurant (NEVER EVER a public toilet though, unless you are UNBELIEVABLY desperate) then you’ll see that not all the patrons can be bothered with this folding malarkey, and it can get pretty gross. Luckily for YM and I, the house we have rented for two months in Xania has modern plumbing, and so consequently I am fast losing the expertise in Origami that I learnt in previous visits to this amazing country. Anyway, back to the Porto Loutro….after a quick unpack we venture out to explore the village….. As there is only the waterfront to see, and as most of the taverna’s lining the bay are closed, it doesn’t take very long. While I say that most places are closed, they are not shut up…. All of them are in the middle of renovations preparing for the opening of the summer season which officially starts next weekend…. ‘Orthodox’ or ‘Greek’ Easter…. and the owners and their families are hard at work ( a relative term, as used here) getting their places spick and span. Loutro, we were told, is the place to visit if you like absolute piece and quiet….. They forgot to add “except in the week before (Greek) Easter”. There is lots of banging and hammering and drilling going on…. and of course lots of painting, but at least you can’t hear them doing this task. 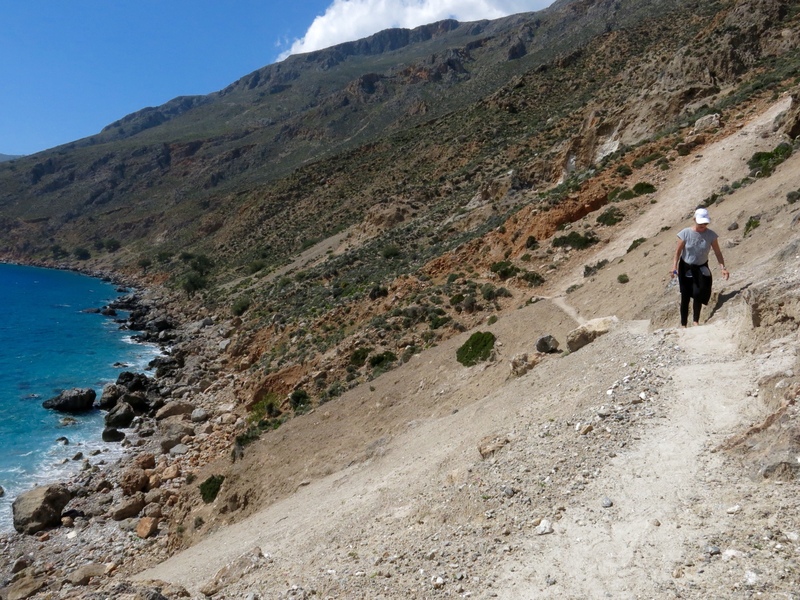 It was probably a mistake to try to walk to ‘Glyka Nera’ beach or ‘sweet-water’ in English, so soon after lunch, but a lovely Irish family we had met, also staying at Porto Loutro hotel, had told us that it was a lovely easy walk….. had they consumed too much Guiness…. it was a nightmare. Glyka Nera is only about 2 kilometres away from Loutro ‘ as the crow flies’, but a good bit longer scrambling up and down and in and out and along the cliff face…. the narrow cliff face…. Let me repeat that….the VERY NARROW CLIFF FACE! 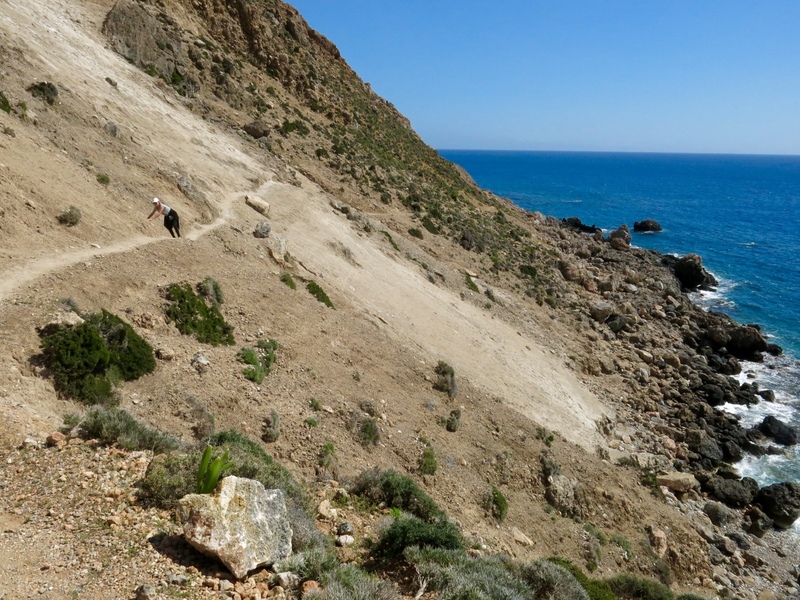 The walk started quite easily, we just walked up the hill on the goat track out of Loutro …. remember that there are no roads here…and it was very picturesque, and safe, it even had a big steel fence on the cliff side of the walk. We met a few hikers coming from the other direction, they had walked from Hora Sfakion, and were fully equipped for the hike…. walking boots, walking poles, hiking pants, backpacks etc…..( some looked like they were preparing to climb Everest!) while I was was walking in a tee shirt, shorts and pair of ‘Sketchers’ and YM in a pair of crocs…. ( not the ugly ones, but the fashionable ‘ Olivia’ style ones.) After a quick walk up the mountain we were high above the the bay and admiring the views…. that is until the steel fence suddenly ended, and we found ourselves looking down the cliff to the rocks and the sea a few hundred metres below us. YM doesn’t really have a head for heights, and while I was enjoying the walk, she was quite nervous…and refused to look down. On the road to ‘Glyka Nera’. I was making good progress along this treacherous section of the walk, and reached the relative safety of the other side of the landslide. Looking back, I see YM has stopped right in the middle of the landslide and is not moving. ” I can’t do it” she yells at me ” I’m scared” Despite all my encouragement she isn’t moving either, so I go back to her and tell her that we’ll go back. “No” she yells, ” you don’t understand, I can’t move from here… I might fall” After negotiating my way around here…. it is quite dangerous and I’m quite nervous myself I’ll admit….I take her hand and we again inch our way back the way we’ve come.We never did make it to SweetWater Beach…. but we did make it back to Loutro safely. At the hotel, Allison informs us that we should have taken the boat service to SweetWater….it goes there every couple of of hours!